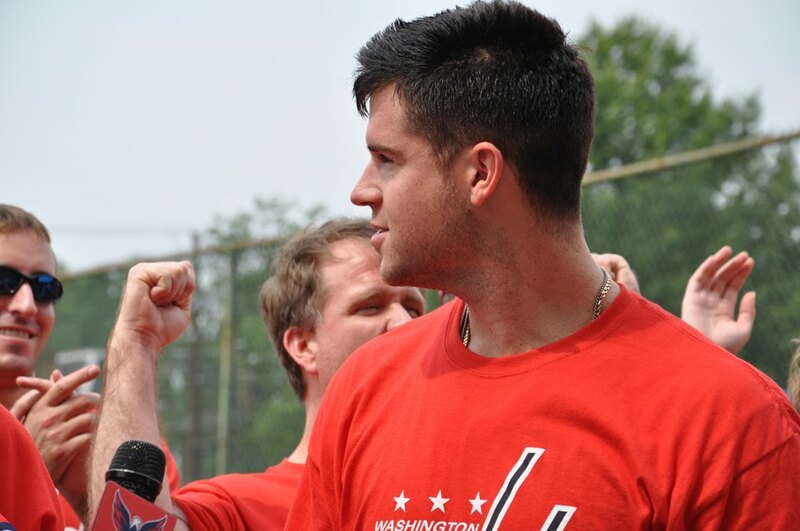 Tonight’s the night, ladies and gents: It’s Game Friggin’ Seven. How pumped are you? Because I’m too excited for words. 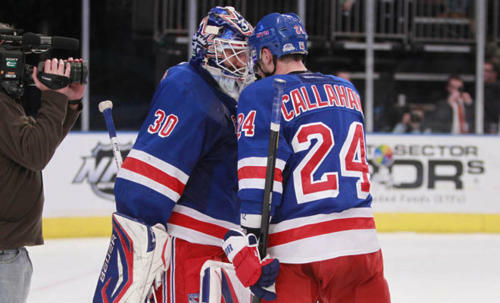 I’m pulling for the Rangers, because they completely deserve it, but we shall see. The winner of this game plays the who-would-have-thought-they’d-be-here New Jersey Devils in the Eastern Conference Finals. 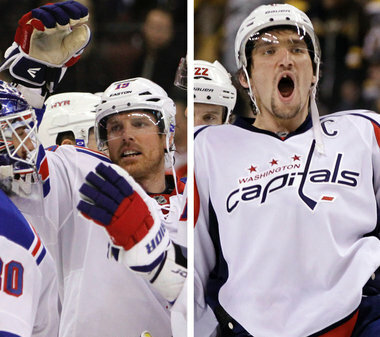 Get excited, fans, it’s gonna be a rocking game in the Garden tonight! 1. 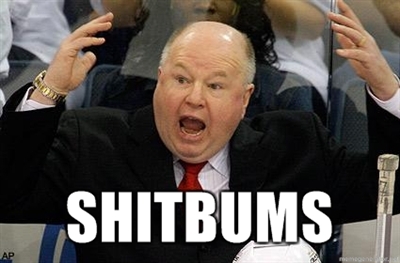 Bruce Boudreau was fired and replaced by ex-Cap Dale Hunter. [Click here] to watch his ‘Welcome to the team’ Presser. Pants from What’s Up, Ya Sieve? couldn’t have said this any better. Well said, Pants. Well said. Check out the Canes site sometime after 5pm for his presser. 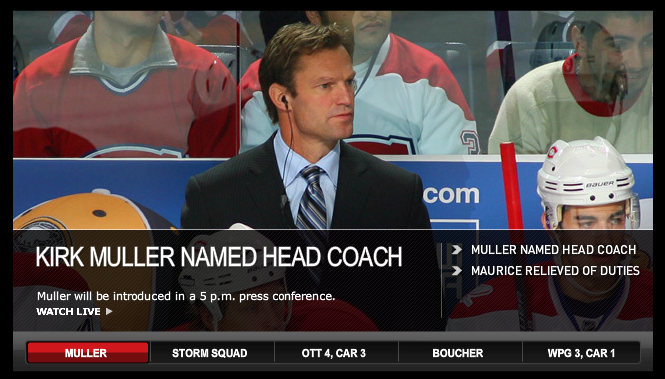 Lets hope that a coaching change is just what this team needs to be successful. 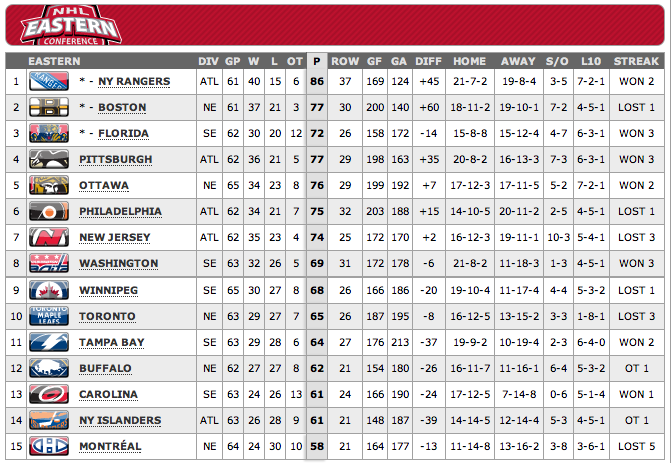 It hurts to see EStaal and Skinner struggle. 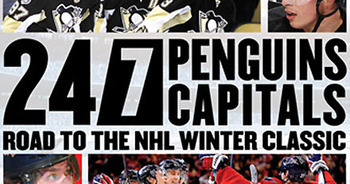 Kris Letang is still hot. Even with a broken nose. [Click here] to see what he had to say after practice today about his nose, imPACT testing and the possible suspension on Pacioretty. I’m crossing my fingers and toes until I hear that he has passed all testing and is cleared to play tomorrow night against the Rangers. Sidney Crosby was named 1st Star of the Week by the NHL. Surprise. Surprise. 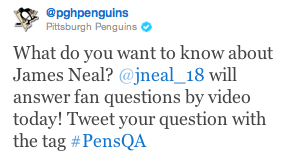 And for all you James Neal fangirls (myself included), hurry on over to twitter! UPDATE: Well, shucks! I’m late. He already answered the questions. *shrugs* Oh well, just saves me from embarrassing myself. PHEW! Ok, I think I covered everything for today. Categories : Congratulations, Fail, OMG! I think it’s his ability to beat someone to a pulp but then turn around and smile. I just think he’s so adorable. 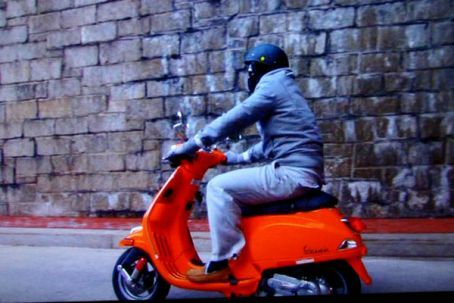 But if you ask me on the street….I’ll never admit it. So my mom decided she needed to make a checklist to prepare for this “hurricane”. ….and the list goes on to about 10 different things. We spent the entire day completeing this checklist, making sure there is no possible way Irene could surprise us. By the way, as I’m writing this–I find out it has been downgraded to a Cat 1 which is just annoying to pick up after & no fun at all according to S (my resident Tropical Storm/Hurricane/Tornado Advisor). Anyway, I decided to take it upon myself to make my own checklist. It’s simple, really. Anyway, I feel like this will make for one awesome Tropical Storm/Hurricane (whatever Irene decides she wants to be). Wine + My FAVORITE boys EVER = 1 GREAT Hurricane Party. BRING IT ON IRENE! I’m so ready. PS– let’s hope I don’t loose power. I got some great guys coming up on the Countdown that happen to fall during the storm…. 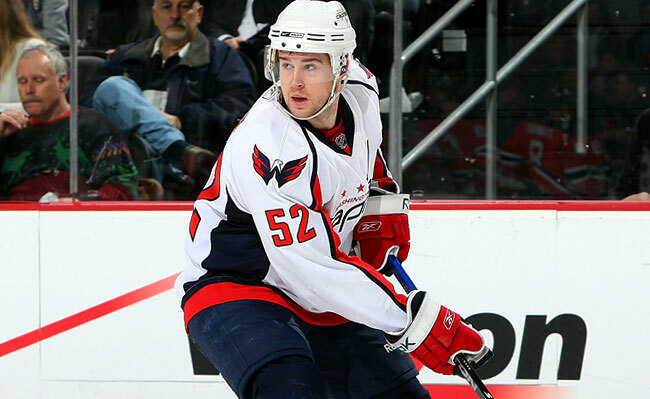 What kind of female-run hockey countdown would this be without Mike Green? It would be boring…that’s for sure! This picture will never get old.